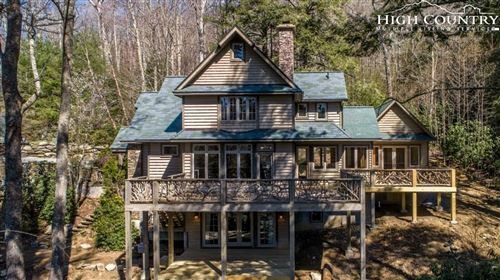 Tucked outside of Banner Elk, is this 74-acre private estate with a stately hand-hewn log home, detached garage, pasture, pond, and creek running the length of the property. The cabin radiates a warm ambiance both inside and out that truly makes the space comfortable and inviting. The home was constructed with hand-peeled white pine logs with dovetail details and varied chinking that displays an unmatched level of craftsmanship. The oversized kitchen features quartz countertops, a gas range, double oven, wet bar, and butler's pantry. Off the dining area is a screened-in porch with an outdoor fireplace, perfect for entertaining. The sizable front porch could accommodate many rocking chairs and porch swings for a summertime hangout. More entertainment awaits downstairs with new wool carpet throughout the billiards room and den. All guest rooms have ensuite bathrooms. The newly constructed, detached two-car garage includes two bedrooms and two bathrooms on the upper level. For the connoisseur of life, an ideal home is in perfect harmony with its surroundings. This grand estate embodies the most idyllic, tranquil mountain setting you could possibly find. We respect your online privacy and will never spam you. By submitting this form with your telephone number you are consenting for Derek Rowley to contact you even if your name is on a Federal or State "Do not call List".